Prague is that magical little town inside a perfectly sparkling snow globe. It's quaint, charming, and romantic, and encapsulated in its own world of wander. I mean, you've seen the photos. 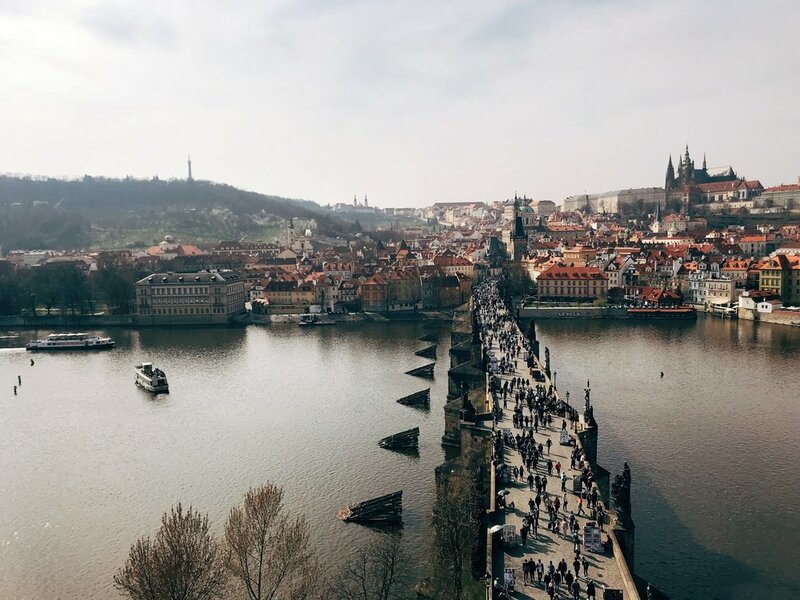 It's straight out of a pop-up storybook, the way Prague Castle stands tall in the background as it hovers over the tiny red-rooved buildings and the long stretch of Charles Bridge, dividing still waters. And you feel like a character in a historical fiction novel prancing around cobblestone streets, collecting bread and beer. That's just the magical aura of Prague. You get all of that and even more. So the best I can do to give it the allure it deserves is share my favorite spots in this walkable city. 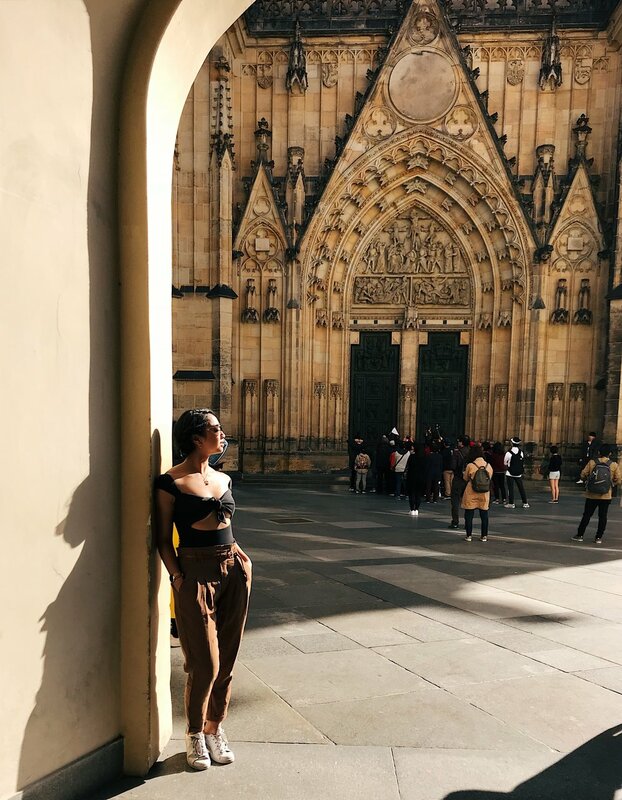 You will definitely cover all of Old Town in 2 days (because that's exactly what I did) and it'll be enough for Prague to sweep you off your feet. This place was recommended by a friend who told us we absolutely had to eat here during our visit in Prague. And not having much else on our food to-do list, we made it our mission to check this place out but I'm glad we did because it was so good! All the perfect little stacks of sweet and savory pancakes that were completely filling and satisfying. The perfect light breakfast or afternoon snack. It's the famous chimney cake you'll see at almost every other storefront throughout Old Town. And they come in so many different versions--ones with ice cream, ones in different flavors, etc. The original, however, is the one with just the chocolate covered inside, and nothing else. No matter what you end up getting, it's the dessert to have in Prague so treat yo self. It's a really adorable area to stroll through. There’s always something going on and the energy is refreshingly lively. The streets are small enough to stroll through without worrying about cars driving pass. It can get pretty crowded so just be cautious! Being a book fanatic with a special affinity for library architecture and designs, Klementium was definitely on our list of things to check out in Prague. It's known to be one of the most beautiful libraries in the world, if not the most beautiful. Unfortunately, due to so much attention and tourist attraction, the most you can see from this library is through a paid tour where you can only view it from a glass wall at the door of the room itself. And even then, they won't allow photos to be taken (although, I snapped a quick one, anyways). But it's still worth it because through the tour, from the Astronomical Tower, you get the most spectacular views of the red-roofed buildings throughout Prague's Old Town area. Honestly, how can you not? It’s the iconic Prague site to visit and an important piece of history. My recommendation? Catch it during sunrise before everyone wakes up so you can enjoy it in its entirety without fighting other tourists for photos. And it’s a simple 10 minute walk. You’ll appreciate it much more then. Fun fact: beer is way cheaper than water. And knowing that little fact, it's almost impossible not to drink all the $2 beers in Prague, especially if it's known to be the good stuff, too. So head over to the cute little restaurant that sits by the river and looks up to the Charles Bridge (I recommend around 6ish pm), order yourself some beers, and take in the beautiful views of Prague. I promise you, it's the quinessential Prague experience. After you've walked across the Charles Bridge, you'll be in a different section of Old Town. Though there isn't as much as Old Town Square, you'll still want to make your way to the top of this hill towards Prague Castle. You'll immediately be greeted by street musicians and scenic painters (I bought a small postcard painting from one of them!) while being enveloped by a beautifully vast view of the Prague. I mean, aferall, Prague is definitely known for its postcard views so you have to go to every angle! And the castle itself is spectactularly grand and majestic as it stands unperturbed by crowds of tourists trying to get a shot that even captures the top of this massive, ornate structure. So you can try, but the most I got was just half of the front! I'm not really sure the origins of this wall and why it's in Prague, but it is a famous wall completely and vibrantly colored with wall art and graffiti all attributed to John Lennon. The wall isn't that long and you'll probably be fighting with other tourists to get an empty spot for a photo, but it's worth checking out, anyways. The area it's in, Mala Strana, is also easily walkable and quaint enough to walk around and check out the little shops. There's also the John Lennon Pub right around the corner that is also an artful homage to the musical messenger of love. No matter what you end up doing, Prague is such a beautiful and simple city that you really can’t go wrong. I stayed mostly in Old Town but I immediately fell in love with how quaintly European it felt and its artistic commitment to history in constantly restoring its buildings/sites. I didn’t get a chance to check out the famous Astronomical Clock, one of the oldest in the world, due to maintenance (my point about Prague maintaining historical upkeep) but I do hear it’s a beautiful piece to check out and explore. I always get asked if two or three days is enough to see and do Prague. Honestly, there is never enough time to truly take in travel and I wish I could always stay longer at any place I visit. But Prague is small enough to get all of the above done in about two days (that’s how I did it!). Next time I come back, I’ll visit during holiday season since I’ve heard it is so beautiful during this time and they really turn it into a real life snow globe of magical lights and festive music. [ Berlin ] Or Should I Say Beer-lin?